Barbecue Master: Grilled Cheese Potatoes - NO - I don't think so. Don't you just hate when you find a recipe that sounds heavenly; then, you make it up, and it's just a mess. Sure. There are cooking errors to factor in. But, there are times you just KNOW the person never made the dish and just pumped out some junk to get readers. There is just no way the dish could work. The idea sounds good, but it's just not going to work out no matter how good you are at cooking. Tonight, I decided to try some jazzier tin foil potato packs on the grill. I found a recipe online that had cheese and bacon. Yum. That sounded like a good side dish. We have some great potato recipes including my traditional potato tin foil packs and even potato slices right on the grill, but I wanted something new, different and extra special. What a mess! You can see in my photo exactly what I'm talking about. When I got to thinking about it, I should have known better than to put cheese in foil packs. Foil packs are basically a baking method. I'd know better than to throw potatoes in a baking dish with a little cheese and butter. There's just not enough liquid there. 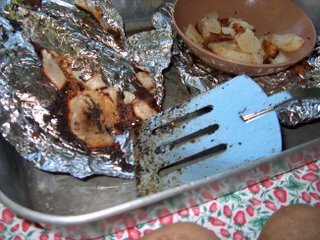 What happened here was that the cheese (which is soft) melted and then burned to the tin foil as the potatoes were cooking. It takes a good while to cook potatoes. So, even with butter in there, the cheese just cooks way too fast to be in there with a root vegetable. We were able to salvage some of the potato side dish. It was not easy. It was not pretty. And, it didn't even taste that good. The cheese that did manage to hide between potato slices was kind of rubbery. Ugh. I guess the moral of the story is to get your recipes from someone who knows what they're talking about. Anyone can write up or post a recipe of random items that sound good. That doesn't mean that the recipe will work out. All my recipes at G&H Barbeque Master are right from my grill with photos in many cases. You better bet you won't see cheese potato tin foil packs on my space. I don't set my readers up for failure before they even get started. Sounds like someone doesn't know what medium heat is. Did you spray the inside of the foil?